Every time that I look at this picture, I am temporally brought back in time. Back on this foggy day in the Northern Vietnamese town of Sapa, reflecting on the lesson that I learnt. I had arrived in Sapa the night before, with the long train journey from Hanoi, very excited to see and meet the Tribe People of North Vietnam. A very young Me, full of expectations towards his photographic journey. The next morning I start walking early, in a thick fog enveloping this small town surrounded by mountains. I walked up and down the hills for more than 10km before reaching the nearest village, very obsessed by the idea to get great portraits. Unfortunately that day, as it happens many times, life doesn’t match our expectations. The great pictures that I was dreaming of, just were not there and I slowly became sad and unhappy, as I had to be already back in Hanoi on the following day. 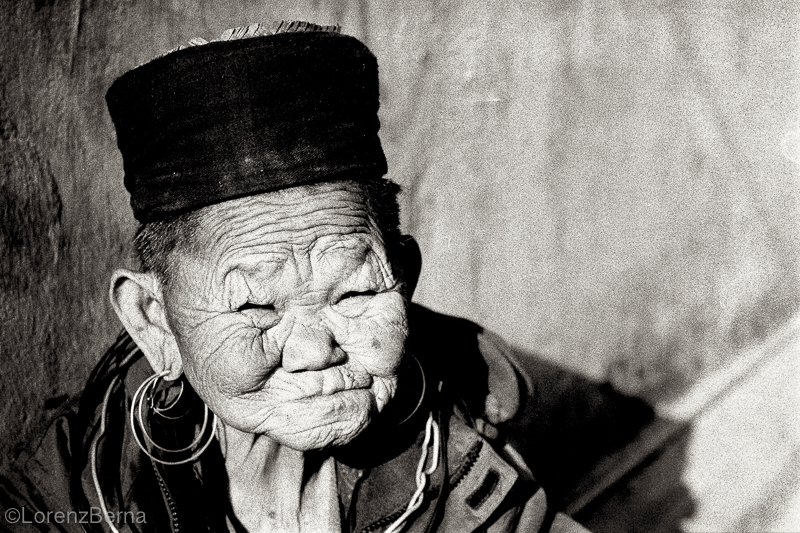 It was back in town, passing the gate of my guest house, that I saw a very old Hmong Woman at the end of the street. She was sat on the floor, simply enjoying the latest sunrays of the day. Instantly I got uplifted. She was such an interesting face to portray. At that time I was shooting only black and white film with a fully manual pentax k1000 so every shot, every exposure had to be carefully thought. Humbly, I approched her with a heartly smile and asked her permission to let me come closer. I love shooting portraits with 50mm lens. Although this focal can be a little bit intrusive, I do like the proximity with the subject and the fact that you can make a real connection. In Travel Photography, and especially if we deal with people, we don’t have to be victims of the “Photo Wanting Process”. Of this attitude of being blindly trapped in our thoughts and start to become stressed and miserable. Instead, it is important to stay constantly very vigilant and Present, moment by moment, and accept what really comes and not only what we would like to come. This way, we’ll lose nothing of the unexpected and of the spontaneous occasions but we’ll also be able to fully enjoy the process at the same time. Without giving up the previous research done at home, we should then leave space to improvisation, once in location. If we practice this mindful approach to Photography and progressively bring it back in our daily life, not only we’ ll become better photographers but we’ll also probably become better human beings.